UK’s legal shame: Did court break law by trying to keep disabled people out of hearing? According to the Equality Act 2010, a person discriminates against a person with a disability if they treat such a person unfavourably because of something arising as a consequence of that person’s disability. So the Court of Appeal breached the Act by trying to keep disabled people out of a hearing over whether Oxfordshire County Council broke the law relating to another disabled person. Right? There were chaotic scenes on Thursday 17 August as Oxfordshire County Council, the borough in which David Cameron’s former constituency sits, appeared in a central London court. It was there to defend itself in a case which is a legal first. And the case the Tory-run authority had to answer? That its austerity-driven cuts to vital services may have broken the law. The Court of Appeal was hearing the case of Luke Davey. In November, a judge granted the 40-year-old from Oxfordshire a judicial review against the council, following a 42% cut to the amount he received to pay for his care and support. This is because Davey has quadriplegic cerebral palsy, is registered blind, and requires assistance with all of his intimate personal care needs. But Davey’s case is a legal first, because his lawyers are using the Care Act 2014 to argue that the council has broken the law. Specifically, that Oxfordshire County Council has breached its obligations under the “wellbeing” principle of the act. Disabled people’s organisation Inclusion London and campaign group Disabled People Against Cuts (DPAC) are supporting Davey’s case. The groups had organised representatives to support Davey before and during the hearing. 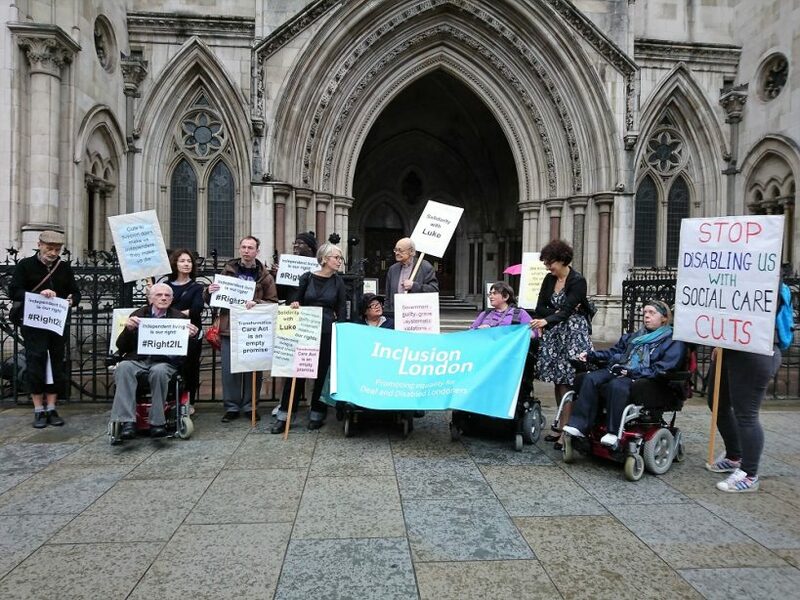 And in another legal first, Inclusion London was granted an intervention in the case by the judge: the first time an organisation led by disabled people has been given this privilege. But there were angry scenes when disabled campaigners, their solicitors and the media tried to enter the court building. Security at first told them they could not go in, as there were “not enough staff on duty” to cope, and they were not willing to open the disabled entrance. After the intervention of a reporter and several wheelchair users, the court’s security opened up the supposedly ‘accessible’ entrance to the court. But the entrance was barely accessible, and one disabled campaigner was nearly knocked to the ground by a passing cyclist. Its impossible not to feel burning anger at the injustice of this circus, and the establishment protection of those who have acted out a sick sociopathic political policy of institutionalised hatred of vulnerable people through the DWP and “social care” budgets. But it is equally impossible not to feel a great sense of national shame for slipping so quickly and thoroughly from a country known across the globe as a decent place with decent people, to this. No wonder the Cons handed over the tacky end of the stick to the local Councils to deal with the actual cuts and deal with the outrages of their foul cunning plan against the vulnerable.